1. Anigrand continue their fine series of obscure rotary-winged aircraft with #AA-2062, the Platt LePage XR-1 / XR-1A, which eventually lost out to the Sikorsky XR-4 as the USAAF's first operational helicopter. This 1:72 resin kit lives up to Anigrand's customary quality standards, and provides options to build either of the prototypes; the XR-1 '1001' with its angular nose/canopy profle, and the rather more stable XR-1A '26521' which also had better visibility from its more rounded cockpit 'bubble'. The only other difference between the two as depicted in this kit is in the shape of the exhaust pipe. 2. 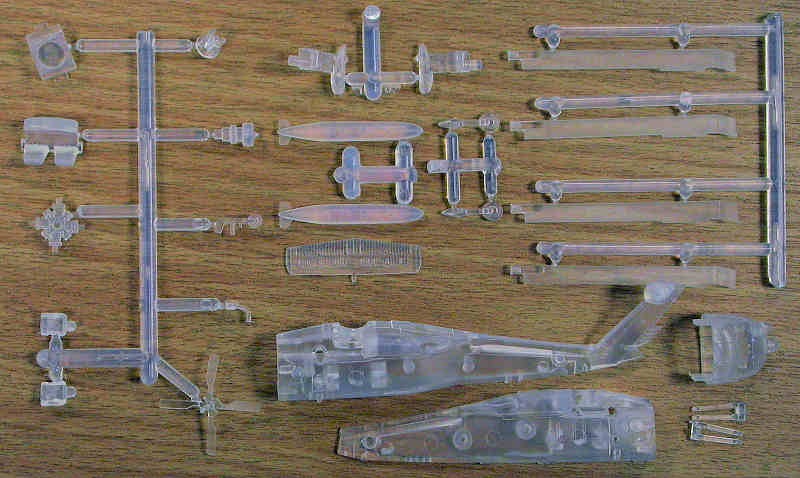 Here's a more detailed look at the 1:144 Platz 'JASDF UH-60J Rescue Wings' kit (HKN #217). As we said earlier, the two identical kits that you get in the box are moulded in clear but slightly opaque plastic. It is curious that the kits are 'snap-kits' in that they can be assembled entirely without adhesive if you wish, but yet they provide both a very detailed decal sheet and a sheet of etched metal details. It may be that in Japan the basic kit is also available in 'trading toy' form (which would explain the 'F-toys confect.' logo on the box). 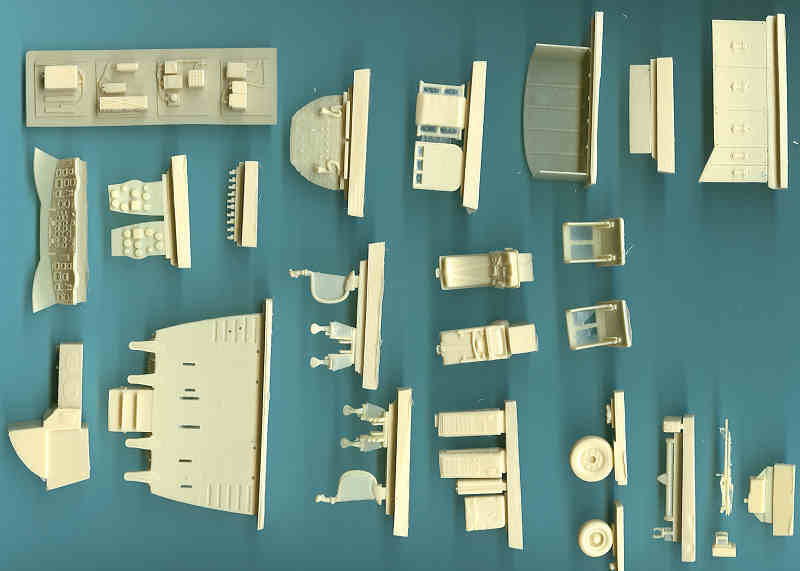 Despite this, the mouldings appear to be accurate and very well detailed; the built-up models should make a good addition to the rapidly expanding range of helicopters in this diminutive scale. 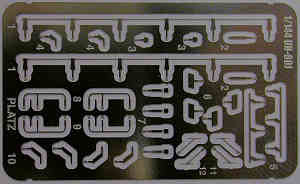 The etched sheet carries twelve parts for each kit, comprising windshield wipers, and a suite of sensors, aerials and antennae. The extraordinarily detailed decal sheet has markings for 98-4569, which is in a 50th anniversary special scheme, and 28-4555 in the more usual but still very colourful JASDF rescue scheme. Painting these little chaps is likely to prove interesting, if you're ready for the challenge. Cockpit floor separated from the cabin deck and the forward end corrected and detailed; the yaw-pedal mounts added (they were missing), and the yaw pedals enhanced with the addition of hydraulic cylinders added and other minor details. Centre pedestal, instrument panel and overhead console extensively detailed. Cyclic sticks refined with more realistic boots and grips. Seats and mounts detailed and backdated to the original cushions for the A/B/C aircraft and have molded on belts. Circuit breaker panels totally reworked for size and shape. Armor panels for the flight control closet added, entire avionics shelving bay size corrected, much detail added to the avionics and the individual shelves. Troop seat/jump seat that folds down in the cockpit passage, two first-aid kits, and the soft bag for holding documents and log books added. Wheels and tyres reworked to the early style, disc brake assemblies and calipers added, rear wheels and tyres have been replaced with the smaller dual type that appeared on the first series of CH-47A's. M-24 machine gun mounts with the M-60D guns for the two forward positions, with ammo boxes and shell catcher bags. Future set #35021 will be for detailing the cargo cabin and will have exposed station line structure and main waterline supports, troop seats for full capacity seating, reworked upper cabin door and tracks, first aid pouches for mounting throughout the cabin and the emergency lighting units. #35022 will be the upgraded flotation type tyres and the single wheel rear conversion. Other sets that have not yet entered production will supply extensive details for the interior of the aft end, possibly with a complete aft structure replacement and conversions for B and C aircraft. 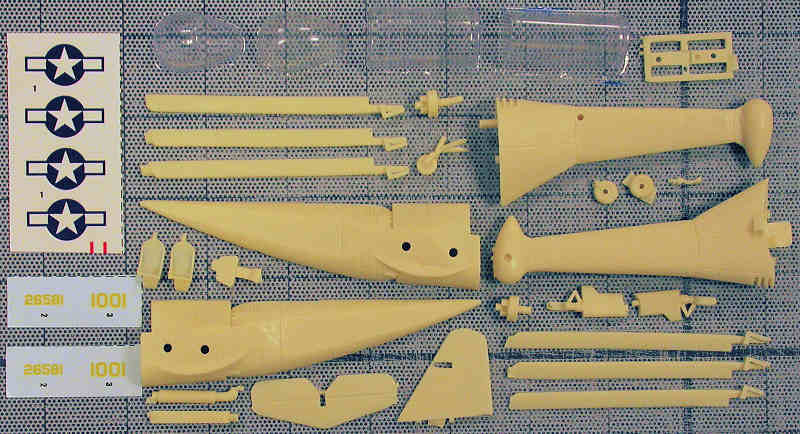 In 1:48 scale, the M-23 mounts and guns for UH-1D/H aircraft are currently being cast. 4. Midland have published another title in their Red Star series. 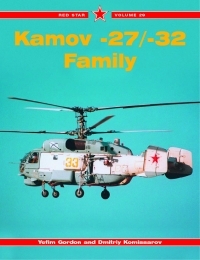 This is volume 29, Kamov -27/-32 Family by Yefim Gordon and Dmitry Komissarov. The two earlier helicopter titles in this series, #14: Mil Mi-8/Mi-17 and Mil's Heavylift Helicopters have reportedly sold well, and included much hitherto unpublished research, drawings and good quality photographs. The current volume, ISBN 1857802373 runs to 128 pages with about 150 monochrome and colour photos, plus line drawings. Following a brief introduction which describes the Ka-27 'Helix' family's anticedents (Ka-10, Ka-15, and Ka-25), The first chapter covers the development history; how the project came into being, and the various prototypes and pre-production airframes. Included here are a number of very interesting details that have clearly come directly from the personnel involved, including test pilots and engineers. 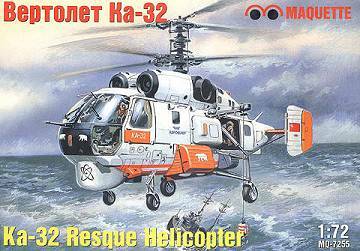 The second chapter lists and examines the various different production Ka-27, Ka-28, Ka-29, Ka-31 and Ka-32 models and variants for roles in both war and peace-time duties. Chapter 3 'The Helix in Detail' is what most modellers will be particularly be looking for, featuring close-up views of both external equipment and the flightcrew and passenger / cargo / equipment areas. In this respect the current book is substantially better than the earlier 'Heavylift' book, which I felt was much too light on interior detail. The fourth and fifth chapters look at the various different civil and military operators, and at the many uses to which they have put the Helix. This takes us up to page 105, all the photos so far have been monochrome, and the quality of these pictures has throughout been of the very highest standard, you could not ask for any better if you had taken them yourself. The following 22 pages and the back cover consist only of colour plates, one or two photos to each 28 x 21cm page, and all again of the very highest quality. There is much in this book to satisfy both the helicopter historian and the helicopter modeller, both will find it invaluable, so Heli-Kit News has no hesitation in recommending it as money well spent. Thanks to Ian Allan Publishing for the review copy of the Ka-27 book, to Shuuichi Manei, and to Chris Miller (Cobra Company).